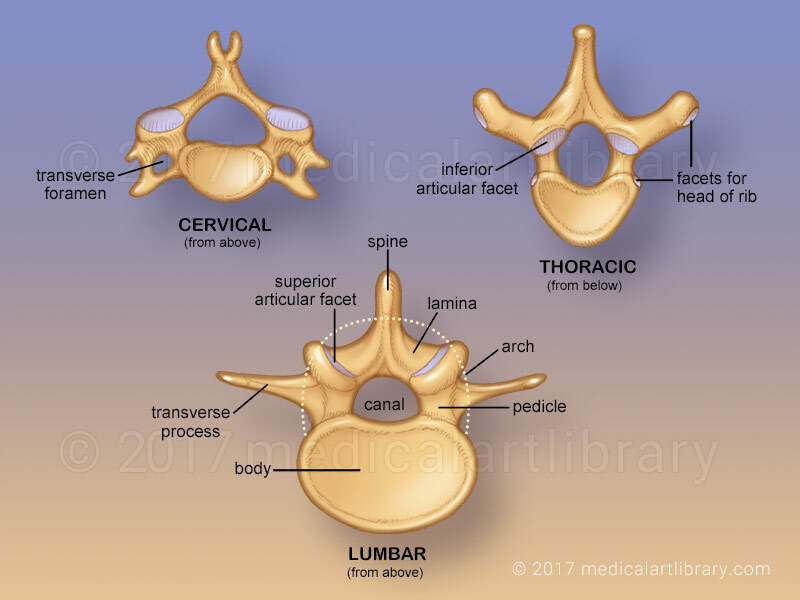 A typical vertebra consists of a body, an arch and a central foramen (or collectively a canal) in which the spinal cord is contained. The arch consists of two pedicles which attach to the vertebral body and two lamina which form a roof. 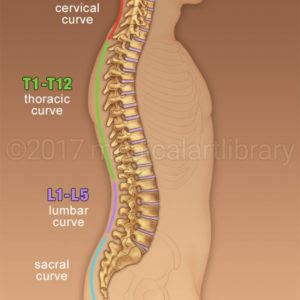 Located on the arch are two transverse processes, a spine, two superior articular facets, and two inferior articular facets. The transverse processes and spine serve for the attachment of muscles and ligaments. 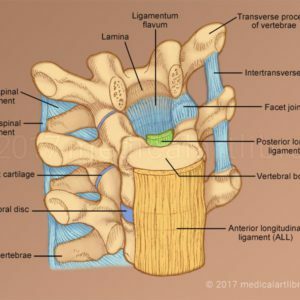 The superior articular facets are covered with cartilage and connect with the inferior facets of the vertebra above to form a synovial joint surrounded by a joint capsule. The first cervical vertebra has no vertebral body and is named the “atlas” because it supports the globe of the head. The second cervical vertebra is called the “axis” because it forms the pivot on which the first vertebrae can rotate. Cervical vertebrae 1-6 have a transverse foramen in their transverse processes, through which the vertebral artery, vein and a nerve plexus can pass. The thoracic vertebrae have a facet on the end of each transverse process and on it’s body where the ribs can attach. 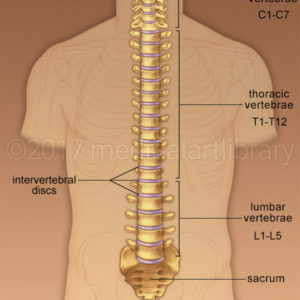 The lumbar vertebrae are the largest of the true or moveable vertebrae and have neither a transverse foramen or rib facets.